Take control of your complexion with First Aid Beauty Skin Rescue Anti-Breakout Pads with White Clay; a daily medicated treatment that utilises 2% Maximum Strength Salicylic Acid to promote brighter, clearer skin. 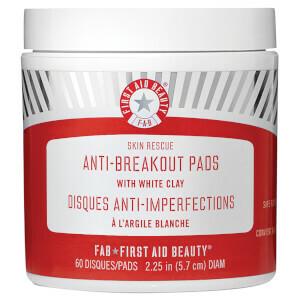 Fortified with natural Kaolin Clay, the face pads effectively absorb sebum and impurities to decongest clogged pores and minimise breakouts. Soothing Tea Tree Oil and Willow Bark Extract work in tandem to improve skin tone and texture; they deliver exfoliating properties, whilst eliminating unwanted shine for a smoother, more refined complexion. Suitable for sensitive skin. Allergy tested. Non-comedogenic. Clean the skin thoroughly before use. Wipe pad across all zones of face once or twice daily after cleansing. Because excessive drying of the skin may occur, start with one application daily, then gradually increase to 2 to 3 times daily if needed or as directed by a doctor. If bothersome dryness or peeling occurs, reduce application to once a day or every other day. Water/Aqua/Eau, Polysorbate 80, Phenoxyethanol, Sodium Hydroxide, Glycerin, Sodium Citrate, Kaolin, Salix Nigra (Willow) Bark Extract, Butylene Glycol, Rosmarinus Offici-nalis (Rosemary) Leaf Essential Oil, Potassium Sorbate, Sodium Benzoate, Camellia Sinensis Leaf Extract, Chrysanthemum Parthenium (Feverfew) Extract, Glycyrrhiza Gla-bra (Licorice) Root Extract, Capryloyl Glycine, Hexylene Glycol, Symphytum Officinale Leaf Extract, Melaleuca Alternifolia (Tea Tree) Leaf Oil, Sarcosine, Leuconostoc/Radish Root Ferment Filtrate, Enantia Chlorantha Bark Extract, Epilobium Angustifolium Flow-er/Leaf/Stem Extract, Cinnamomum Zeylanicum Bark Extract, Xanthan Gum, d-Limonene, Oleanolic Acid.